First of all, I have to mention that this is a pound cake recipe of which the proportion is different from the normal butter cake recipe. 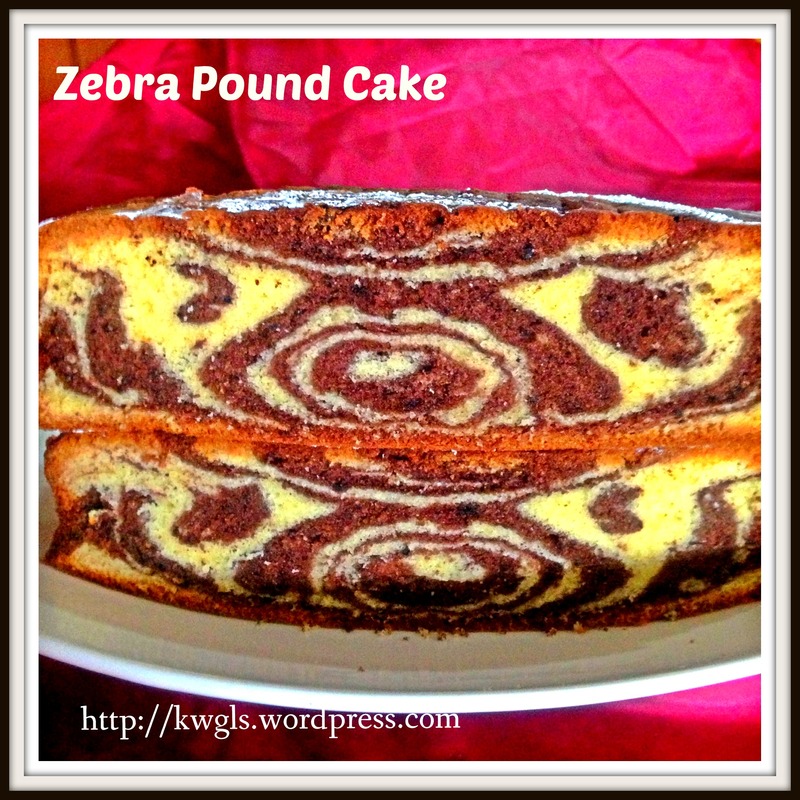 It is a tweet to include zebra patterns in the pound cake. 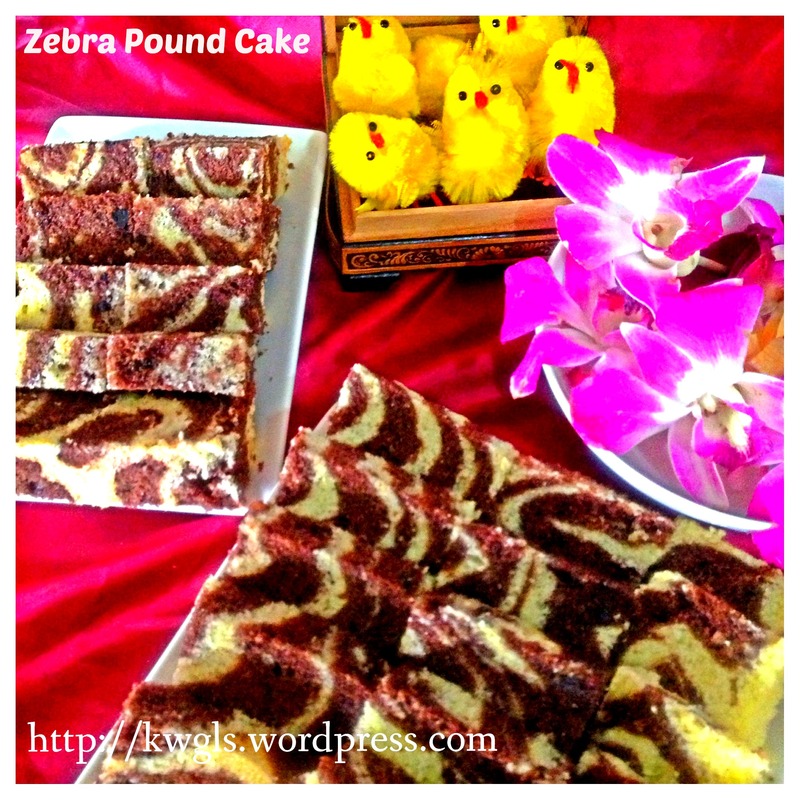 I do not know when was zebra cake (sorry for my ignorance) became popular, however I sensed that it is a trendy cake (correct me if I am wrong) and it is nothing more than a marble cake or another form of butter cake. I didn’t do much research about this cake. 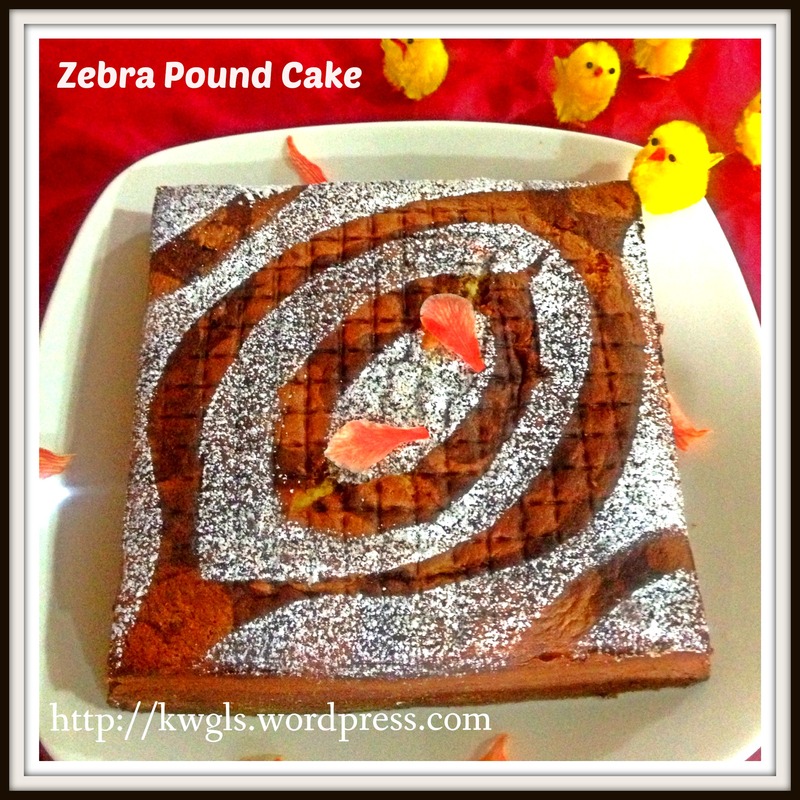 I am just curious about why the pattern inside the cake looked like zebra pattern and how others did it. 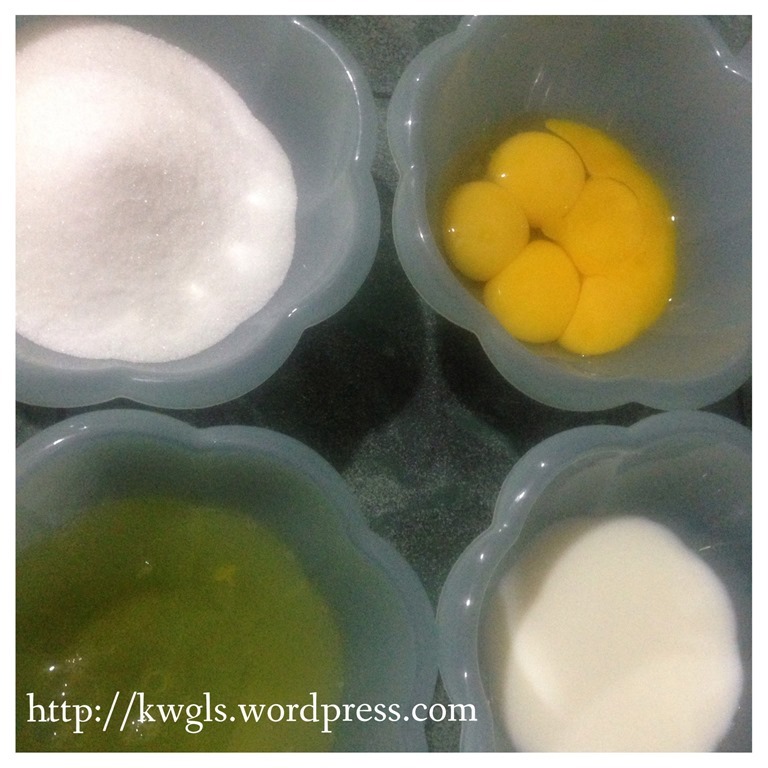 I simply pick up one blog, http://annieliciousfood.blogspot.sg that showed how Annie did her pattern and I took a cake tin and started preparing the cake. I (or Guaishushu that used interchangeably) have a bad habit. Guaishushu don’t like to follow recipes. Guaishushu don’t like to remember numbers. Therefore Guaishushu insisted on using his own pound cake recipe that he had shared in the post 1 Butter + 1 Sugar + 1Egg + 1 Flour + 1 Milk = Pound/Butter Cake-Guaishushu’s Version. 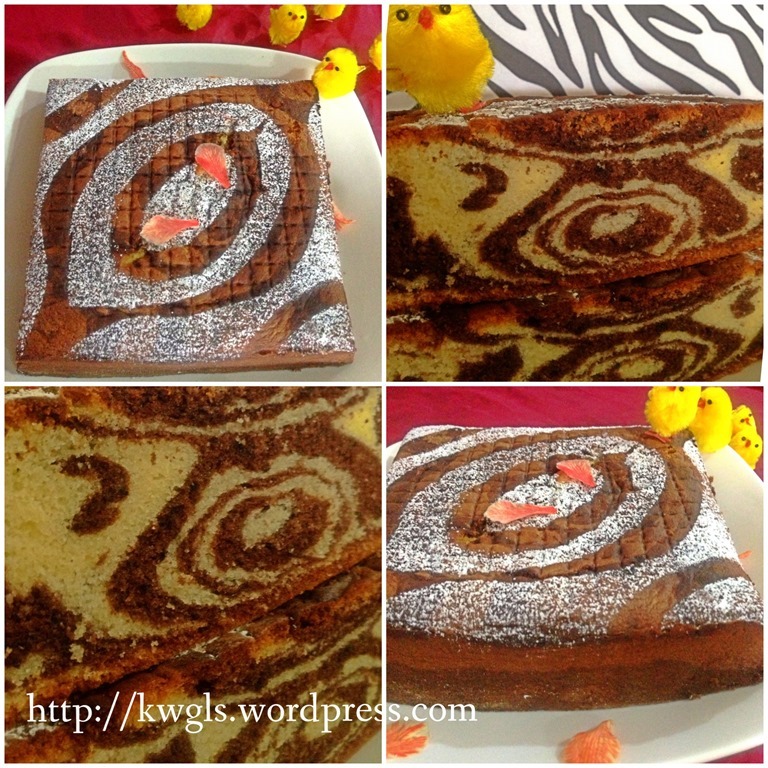 In this post, Gusishushu have simplified his pound cake recipe following the traditional pound cake recipe whereby the volume of sugar = the volume of butter = the volume of egg = the volume of flour = the volume of milk. Rather unexpectedly, the pound or butter cake that he had prepared were moist, soft and almost flat (with slight cracks due to uneven temperature in the oven which is something that bother Guaishushu). In his simple mind, he thought naively that how easy if one do not need to remember the individual volume of the cake ingredients. He knows exactly that he wanted to explore more butter or pound cake recipes to validate his beliefs. 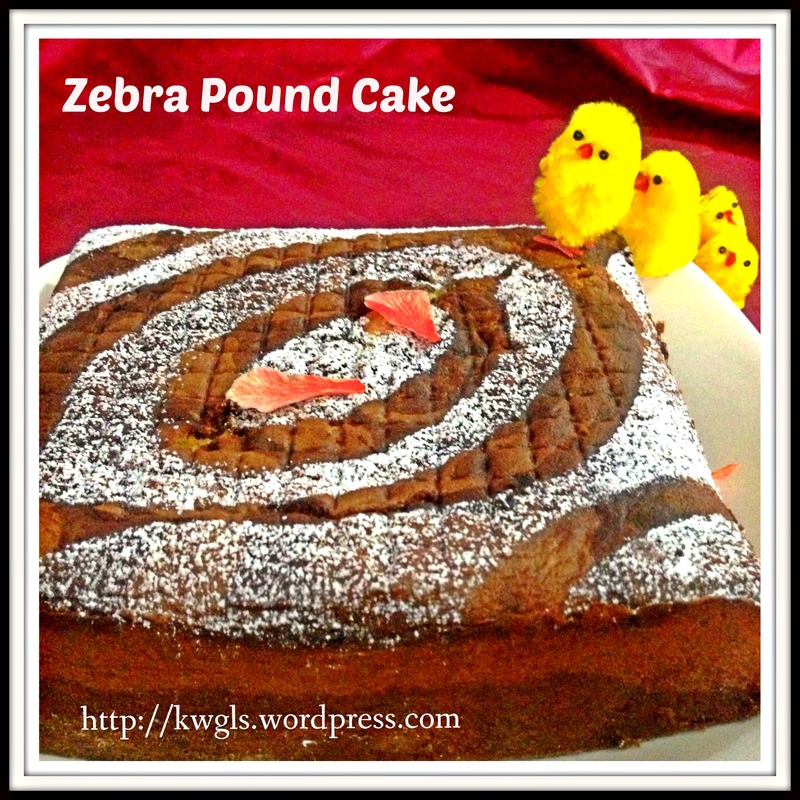 Therefore, this recipe is based on equal ratio theory of all traditional pound cake ingredients. Traditionally (1700s and earlier), this method was used as there are no calculators, no measuring scales and this is the easiest way of making a cake. Subsequently, the ratios of butter and flour start to change, new ingredients (such as milk) were added. If readers want to read more about the pound cake history, you can refer Pound Cake, History Pound Cake, Pound Cake History, Cake History. Well most of the time, Guaishushu cut short his own preparation steps either from view point of conserving natural resources (electricity or water) or time… As long as it resulted with a cake of the same textures and tastes, he will consider the cake as successful and willing to share. Baking expert readers, Guaishushu’s method can be rather controversial and of course will not yield the results that are commercially acceptable due to the lack of professional baking equipment and etc..
250 grams (about 5 eggs) – separated into egg whites and egg yolks. Lightly grease an 8” x 8” baking tin preferably with a detachable base. In a clean, grease free mixing bowl, add egg whites and sugar (if you want, you can add in 1 teaspoon of cream of tartar which is optional). 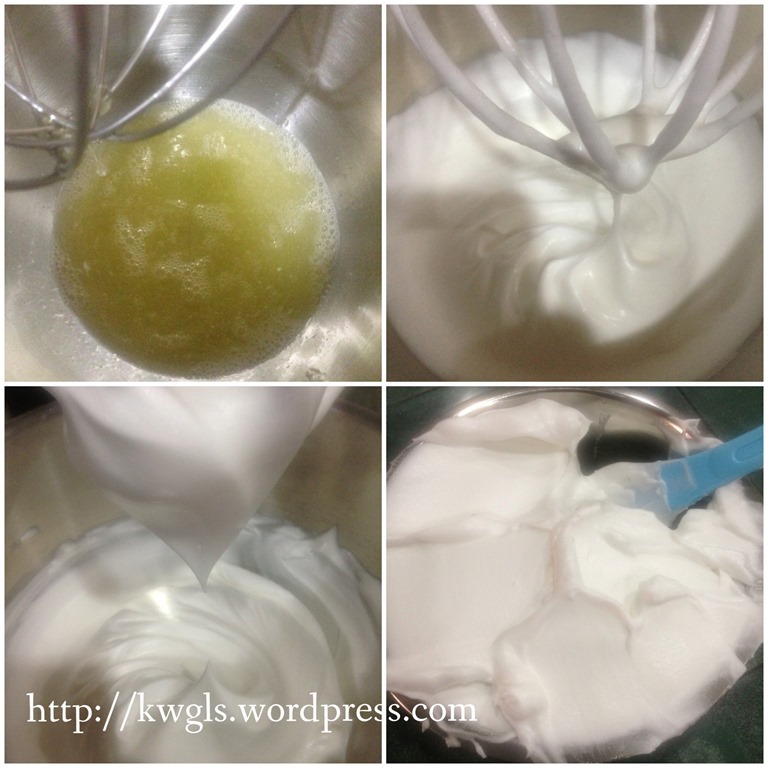 Beat using the machine whisk to whisk the egg whites until firm peak. Spoon the filling into a clean bowl and set aside for later use. If you compare this step with this post, you will note that Guaishushu have put the sugar together with the egg whites and start the beating the process. He did not add in the sugar gradually as usually advised! – Tips 1. If you wish, you can follow that method as in the first post. 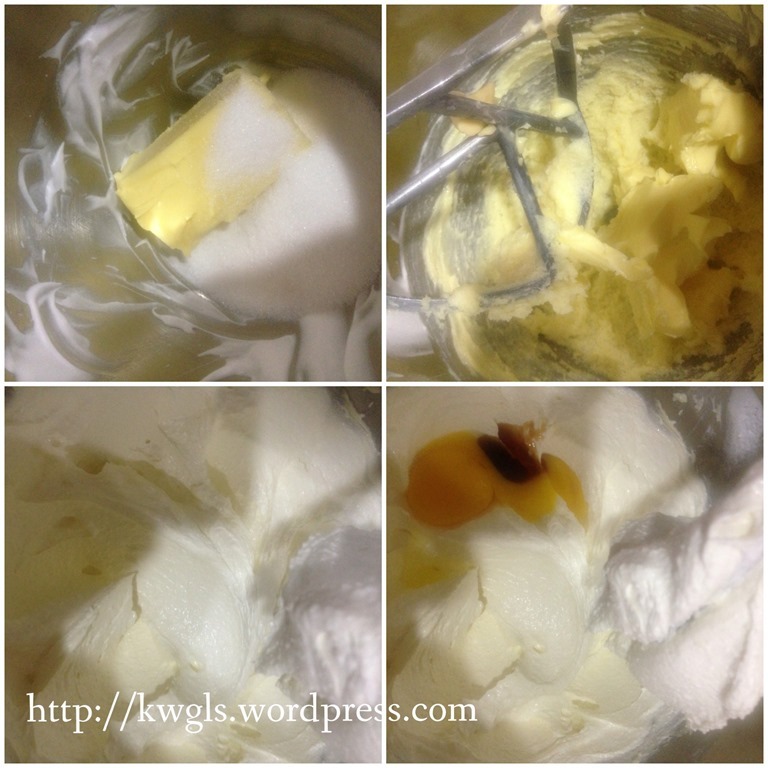 Change your whisk to a K beater (look at the second picture for the shape). Place your remaining 150 g sugar and butter, beat until light and creamy. Add in the vanilla essence and eggs yolks and use slow speed to “mix” until well mixed. Eggs yolk should be added one by one and scrap the bottom of the bowl to ensure no unmixed egg yolk settled at the bottom of the mixing bowl. Off the machine and bring out the mixing bowl. You can use the same mixing bowl that you beat the egg white earlier. You need not to wash the mixing bowl before you placed your butter and sugar – Tips 2. This is only possible if you beat the egg white earlier that the butter batter. But you have to be fast because you do not want the egg white to lose the air support. Most recipes will ask you to use another clean bowl and beat the egg whites just before you fold the egg whites. Theoretically, this is correct but the error of my suggestion will not have a material impact on the cake you bake! Therefore, if you like short cut and avoid washing, you can follow my method. 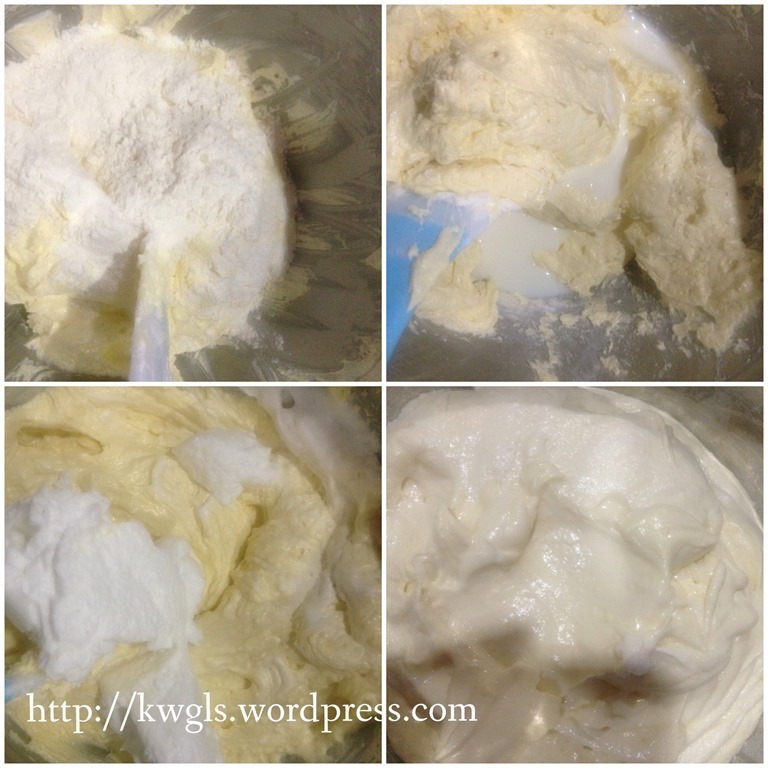 Folding of flours and egg whites…..
Use a big metal spoon or wooden spoon or a spatula, quickly and swiftly fold in fresh milk and the sifted flours. Alternate between fresh milk and sifted flours. 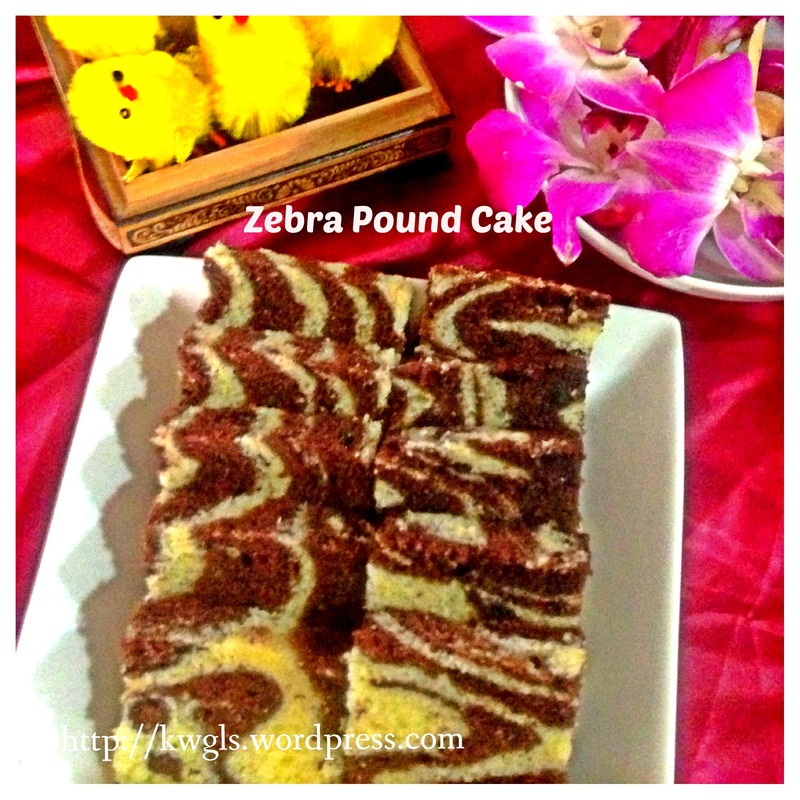 The Making of Zebra Patterns…. Separate the batter into two portion. Put the sifted chocolate powder in one bowl and use a metal spoon to stir lightly until well mixed. Stirring action is just like folding of flours and it should be quick and light. In the greased cake tin (note that I have also slightly floured it but this is optional), start with 4 big tablespoons of the beige batter. Add 4 tablespoons of chocolate batter on top of the beige batters. Shake it slightly so that the batter spread over a wider surface. Add another 3 tablespoons of beige batter on top of the chocolate batters follow by 3 tablespoons of chocolate batter on top of the beige batter. 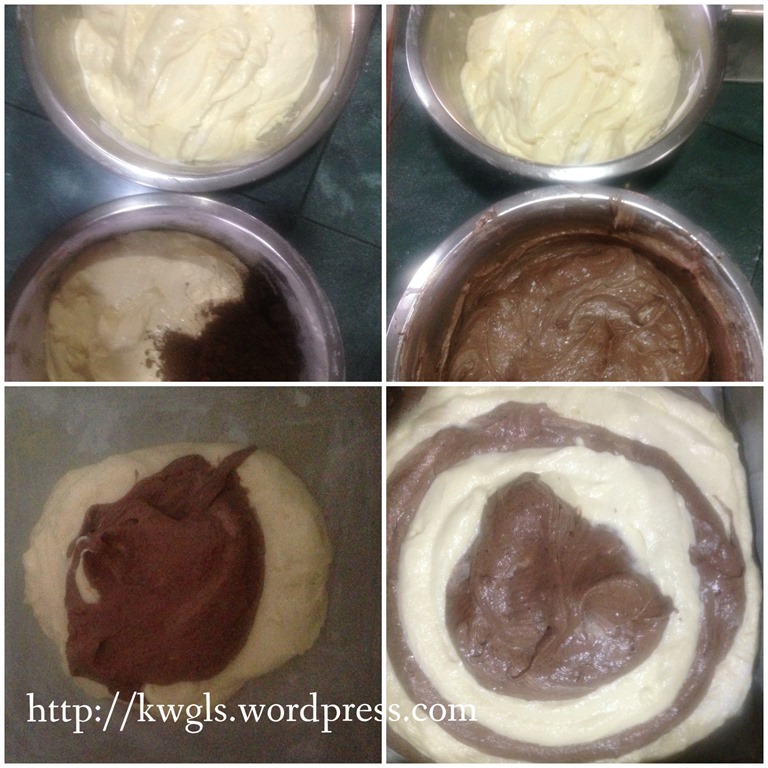 Do the same for the next step using 2 tablespoon and finally one tablespoon until all the batter have finish. 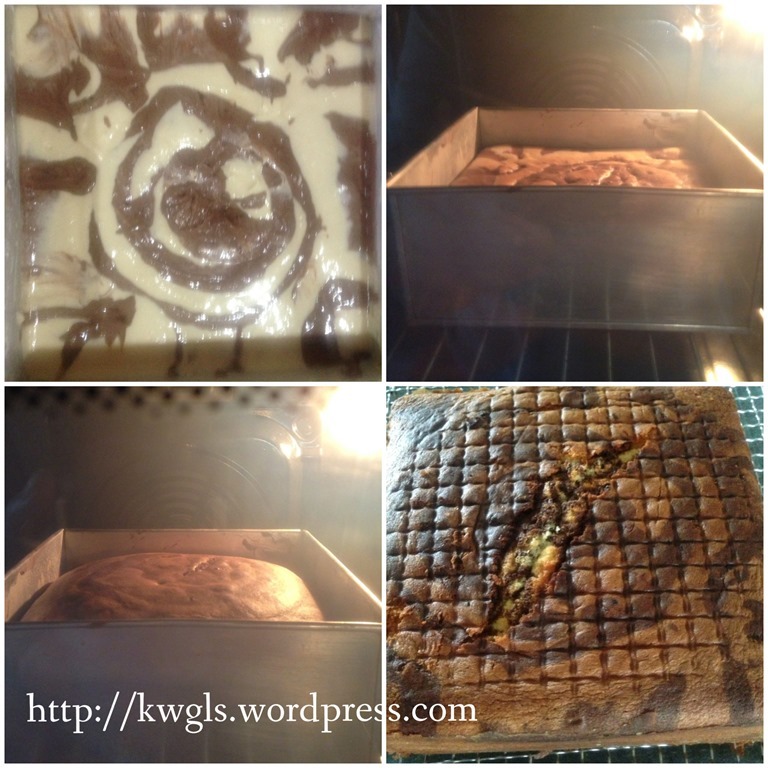 In the event you still have left over, just create another pattern with the batter that you have! Note: My cake still have cracks but subsequently dropped back to become flat top. This is an easy to remember recipe due to constant weights used. Nothing much that I need to say here as most of the detailed steps have been covered in this post. Hope you try and let me know whether the cake is delicious. Have a nice day and cheers. This entry was posted in Cakes and cookies, Food Preparation Series and tagged 8, Beat, butter, calculators, CONCLUSION, Eggs, error, essence, event, Flour, GUAI SHU SHU, Guaishushu, Gusishushu, kenneth goh, marble, marble butter cake, marble pound cake, milk, Most, Note, Once, oven, patterns, Place, postaday, Pound, Preheat, preparation, proportion, Rather, ratio, ratios, reader, readers, recipe, Recipes, Reduce, resources, room, self, Separate, Shake, size, Spoon, STEPS, Sugar, suggestion, tablespoon, tablespoons, tartar, temperature, textures, theory, Tips, Transfer, version, Want, weights, whites, yolk, yolks, Zebra, zebra butter cake, zebra pound cake. Bookmark the permalink. ← Why The Colour Is So Dull But It Is Nicely Painted! Your chicks must be very hungry, so ferocious that they want to eat a zebra!!! 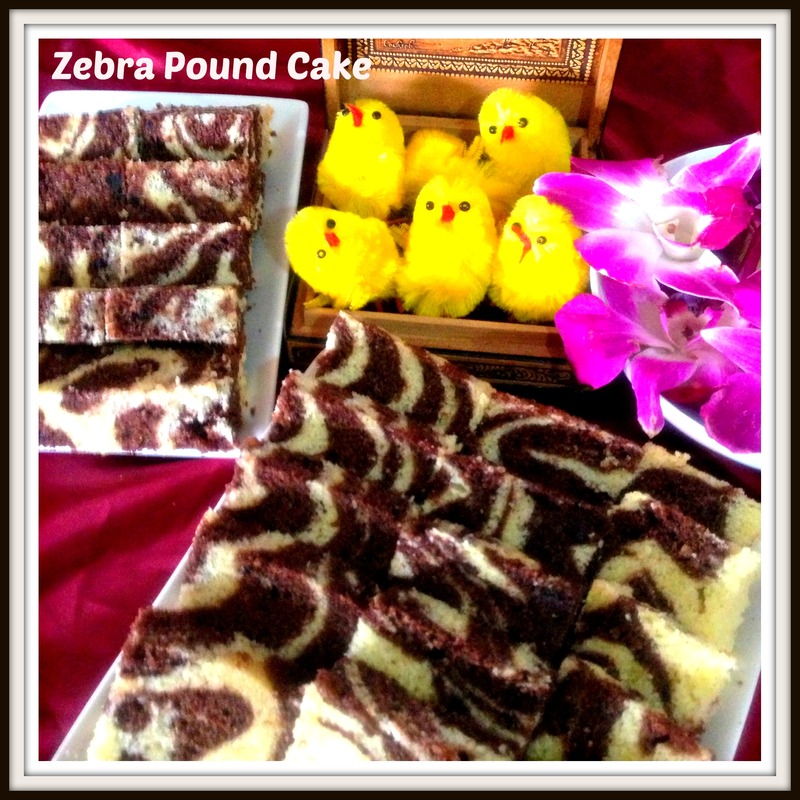 Your zebra pound cake looks very good with its zebra designs… It looks so real that the chicks are attacking it. Thanks! Zoe! 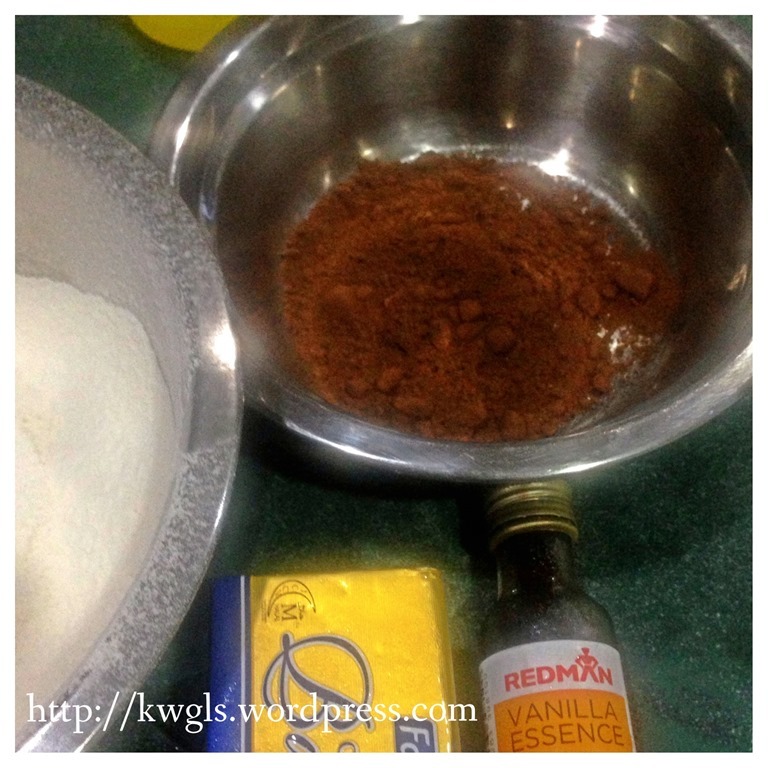 I am going to promote this pound cake basic ratio to apply to cup cakes and others! Haha! I am poor now! I only have a cup to bake! Haha! Have a nice day! Jeannie, it will and the one who performs wonders is milk. 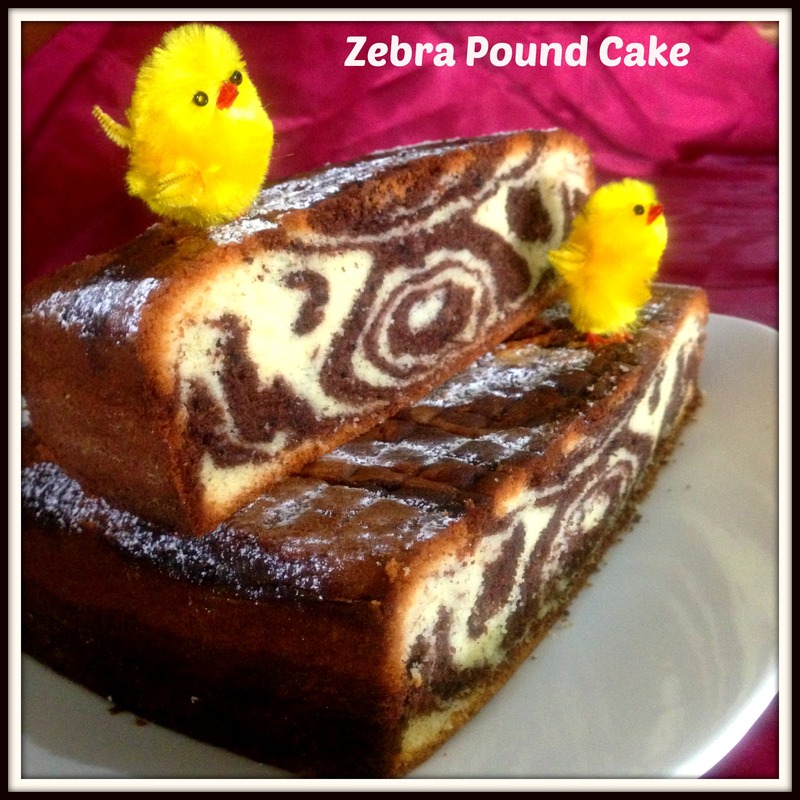 If milk is not enough it will start to crack that happens in traditional pound cake! Cheers and have a nice day. This looks really cute and tasty! I found your post on google+ and it led me to your blog. I haven’t been blogging too long either. I started in March of this year. And it looks like the efforts you put in paid off. I haven’t had the chance (time or energy) to put in as much effort into my blog or marketing it much yet. So I am not getting as much page views as if I were to put more time and effort into it. Anyways, it seems like you are off to a good start and the blog looks great! I am sure you can, Miss Kim. I only have these few weeks where I have some house guest to help me to look after my kids. Otherwise, I am really exhausted also. I spend more hours in blogging than when I am in the corporate world. Bearing that, social interaction is really important and some are asking me whether I am Facebooking 24 hours, ha-ha! Now is a database / library stage, eventually, at least half of them must be dealing with social media interaction! Let’s work hard to make our blog succeed! Cheers. This cake looks delicious! I love your 1:1 ratio method. So easy to remember!